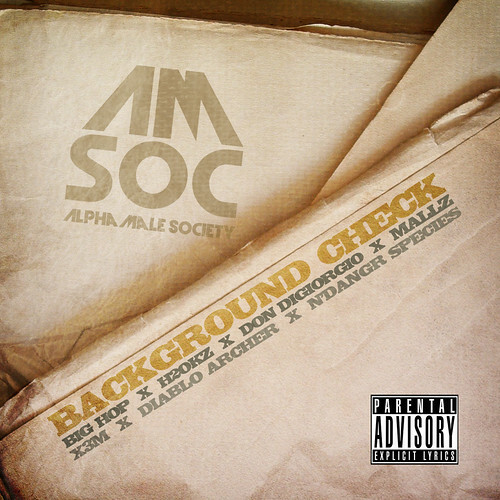 Big Hop (VA/NC), Don DiGiorgio (Greensboro, NC), Diablo Archer (Rocky Mount, NC), H2OKZ (Greenville, NC), N’DangR Species (Charlotte/Greensboro, NC) and Mallz (Raleigh, NC) decided to combine their respective talents into a collective titled the "Alpha Male Society". Since each artist represents a different area and style, they are looking to to create a larger following for everyone. To kick off the new collective, they just released this new mixtape which features production from X3M, Stretchknocks and DJ P’Dough. A video for the lead single "Background Check" is coming soon, and a tour may be in the works as well. The back cover and tracklisting can be found after the jump. 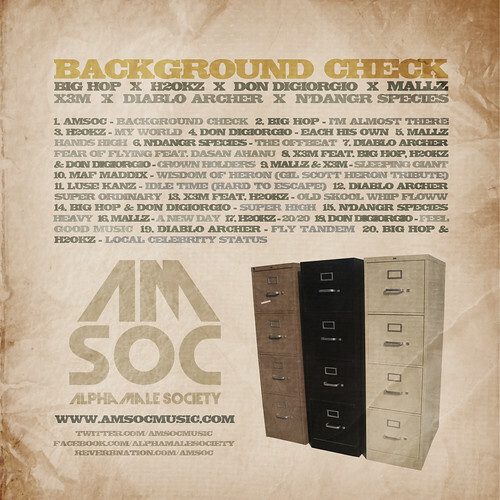 This entry was posted in Mixtape and tagged Big Hop, Diablo Archer, Don DiGiorgio, H2OKZ, Mallz, N'Danger Species. Bookmark the permalink.